Careers & Benefits | Unique Industries | Join Our Party! 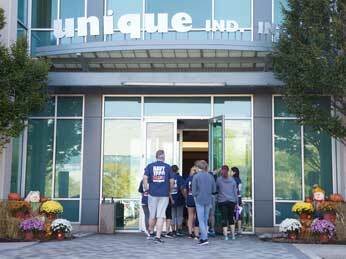 Unique Industries is a family-owned business with over 50 years of industry experience. When you work for Unique, you get all the perks of larger corporations such as 401K, multiple choices of health plans, generous vacation time, and more. The difference though between us and a larger corporation is that here at Unique, we are family. Your CEO and management team are involved in day-to-day operations and make sure that each location sees how much they are appreciated through annual company picnics and holiday luncheons. So if you’re looking for a job that is exciting, rewarding, and team-focused – then apply today! We would love to have you come join the party. Unique has five U.S. offices. To find out more, please visit our three main location pages below or our LinkedIn page to see all job openings. located in Philly’s Navy Yard. Explore our wide variety of positions. Visit our page and join the team. The job keeps your mind sharp. I like the people I work with. You learn something new everyday. It is not a boring job. Always busy. I get to see the product before it get to the store and to see how it is all put together. I've been around here for a long time, and I enjoy the challenges that my position brings. No two days are ever alike, and being located in the Philadelphia Navy Yard does have it's advantages. When it comes down to it, everyone is one big family. I like the different tasks I have to take on a daily basis, and the people I work with. Shipping Department - Blairs, Virginia. During my tenure I have found that everyone is given the opportunity to succeed. Leadership understands the importance of safety. What are the best parts about working here? My co-workers, location at the Navy Yard, gym, casual nature of the workplace, and family owned business. What I like... friendly and respectful culture, fair and reasonable salaries, room for advancement, and I feel that employees are valued as an integral part of Unique's continued success. The company is old, but never stagnant. Good benefits- Health insurance options are a plus! I really like that the company has a private parking lot, and it's easy to get to from out of state. Bonus: Casual dress code. Unique is an amazing company to work for. The Novak Family truly cares for their people. I love working here, and hopefully will be here until I retire! The people here are amazing! Very friendly and easy to work with and for. There is a lot of room to grow with the company. I also enjoy seeing the many products as they come through my department. I like that my manager allows us to push processes forward and constantly develop better ways to do things. Family run organization with direct access to the executives at every level of the company . The company is striving to be more appealing to the younger, incoming workforce. Love that Unique takes part in fundraisers and that family values are important. Great place for recent college grads to gain experience working in business... with great, funny coworkers! Great benefits! I love the summer hours, vacation time, and other perks. The company is run very well, and ownership cares about their employees. My co-workers work as a team. I like the summer hours, closeness to the city, and company culture. The party business leads to a relaxed, upbeat culture. I like the clean, modern work environment. Whether it’s a 5K, picnic, or fundraising event, we invite you to join us in serving the community. We actively participate in supporting national causes like Red Nose Day as well as community-based programs like Operation Warm, where we deliver winter coats to local schools in need. Please join us in making our communities a better place to work and live.